3:37 AM I'm organizing a harmonica summer camp in August! Brendan Power, Boris Plotnikov, Mikhail Vladimirov, Slava Vinogradov, Leonid Titkov, Eugene Ivanov. All details are in the brochure. 5:36 AM Im gutted i can't attend this Jim,especially as its my birthday on the 20th August. How far away are you from Borovets? Thats where i'll be in January. 5:38 AM Borovetz is near Sofia, 600km from Varna. 6:33 AM Thats over 300 miles, pretty far. 9:24 AM Any europeans on forum? 10:31 AM Wow, jim... sounds cool. You just need to add Alex Paclin to the line up as well. I'd love to meet Boris someday too... he's a really great player. Have fun! 12:40 PM Alex is coming to the USA as far as I know! C'mon EU guys, where are you? Ben Bouman (betaharps) and his girlfriend Viola Barends are coming to the camp! So we have two more teachers!!! Your Rharley Silver Bullet is on a slow boat over to ya ,..
Should be there in plenty of time for your BIG BASH !! 4:24 AM Sounds cool. A little too far for me, at least this year. I wish you good luck and a good time ! 10:25 AM It'll be great I hope. I never was abroad early. Excuse my bad English. Click on my photo or my username for my music. 12:53 AM Slava Vinogradov and Ben Bouman have already bought tickets. 8:04 PM I'm waiting for my international passport, it'll be ready in the beginning of July. I think I will be there 100%. 3:10 AM Chances are, Alex Paclin will also join us! 11:07 AM The frustration of being poor and living in Upstate New York. Can't afford to go anywhere and nothing ever happens here. Good luck. 10:13 AM Mihail Vladimirov has bought his tickets and will arrive on 10 Aug, and leave on the 26th. He is a modern jazz diatonic player, a winner of the Trossingen festival. One of the best players in Russia. 5:47 AM C'mon guys, we still have places left! 2:40 PM 30 days left, your last chance to enroll! I have tickets, passport and I'm waiting for Visa. 8:46 AM The whole team has visas and tickets now. I still have a couple of places if someone wants to jump in. 1:36 PM Great Going Jim,. More Pic's? 1:40 PM Killer lineup. I'd love to see some vids or hear some audio, if possible. What sort of attendance did you have? 1:38 AM It's cool here, I'm glad to meet Ben Bouman, Viola Bardens, Slava Vinogradov, Leonid Titkov and of course Jim for the first time, it's nice to meet Mikhail Vladimirov, my main harmonica teacher again as in Russia we live to far from each other. It's great to talk about harmonicas whole day and to get new ideas and opinons. 11:45 AM I want a video! Right now! Guilherme Oliveiro, Viola Barends, Ben Bouman, Boris Plotnikov, Eugene Ivanov (me), Leonid Titkov, Slava Vinogradov, Mihail Vladimirov, Vladimir Tomberg. * Viola Barends and Ben Bouman are helping me to organise it. * Participation fee is paid beforehand, and not refundable. * You can already sign up. 5:09 PM It looks like a really cool harmonica meeting. 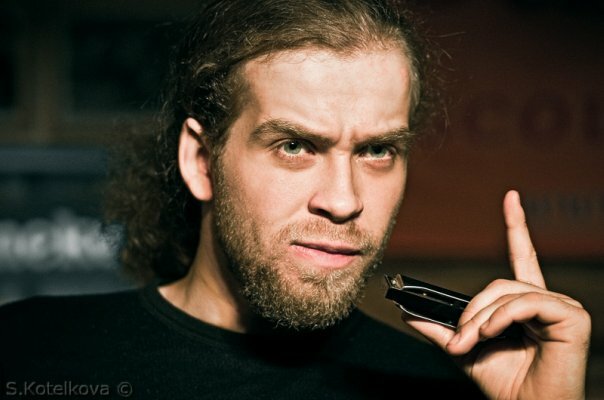 I'm glad that in East Europe we have new "harmonica camps" like Jim's Harp Summer. Thanks for organizing meeteng. It was great! Thanks, wish to meet you someday, at least next year! 4:36 AM Jim, congratulations on running the harp camp - i'm sad i couldn't make this one but am hopeful that i'll make it next year.